Blockbuster can't even pretend that it's holding a winning hand, not anymore. Blockbuster's rather messy financial demise has been a slow, drawn-out event over the past few months. The company recently made headlines because it was planning to spend quite a bit of money on advertising this Holiday season, emphasizing how the company's chain of stores gets movies almost a month before groups like Netflix and Redbox. Unfortunately, this advertising campaign is now moot, because it turns out Blockbuster can no longer claim this exclusivity. Apparently, the company is having such major cash problems that it signed a deal with Fox, Universal, and Warner Bros. that will delay the stores' new release availability. As Geek.com points out, "That comprises over half of new releases, and now puts Blockbuster in the same boat as both Netflix and Redbox." "Movie studios have Blockbuster where they want them-they know Blockbuster is not in any position to negotiate because of their financial position. The studios are getting huge payments for new releases from Blockbuster because they know the company needs them." 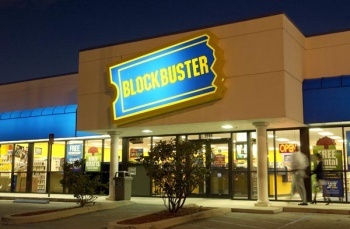 This sounds like it might be the final nail in Blockbuster's coffin, because the company no longer has any advantage over its (much more profitable) competition. Anyone want to start placing bets on when the company is going to finally disappear?